Solo acoustic fingerstyle and vocal arrangements of blues and rags from WC Handy and his associated artists. 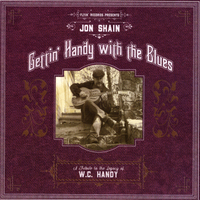 For years, fans at live shows have asked Jon Shain to release an album of solo acoustic blues. This album came about when Jon was asked by the Craven Arts Council and Gallery in New Bern, NC to do a tribute show to WC Handy. Painstakingly transcribing old piano music and listening to hours of Handy's original full band recordings, Shain crafted new arrangements of the tunes for solo acoustic guitar and voice. Some of the lyrics have been updated but most of the melodies shine through like the originals. Included in this collection are some of WC Handy's most famous songs such as The Memphis Blues and St Louis Blues, as well as hits from the great 1920's vocalists such as Bessie Smith, Mamie Smith, and Ethel Waters.